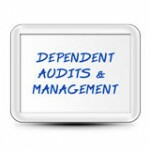 Dependent Audit Services by BCL Systems, Inc. - BCL Systems, Inc. Dependent Audit Services by BCL Systems, Inc. Dependent audits have become more important to employers who are trying to balance their employee benefit plan budgets. Failure to ensure you cover only eligible dependents can be expensive to your plan in overpaid premiums and claims, which ultimately will cost you and your employees more money. BCL Systems, Inc. can help you manage your employee benefit plan(s) to ensure that only those who are eligible to receive these valuable benefits are enrolled in the plan(s). With changes in both State and Federal Regulations, this area of coverage is becoming more complex each day. For example, in the State of Florida, dependents who meet certain requirements can continue health coverage until they are age 30. We can help you deal with the additional work required to make sure you remain in compliance. Have Questions about how BCL Systems can help you manage your eligibility-related concerns? Complete the form below to request a quote.